happy I am with my Holiday Dining Room this year. usual traditional colors and decor of Christmas. well actually more like black and cream ribbon, that I hand flocked. 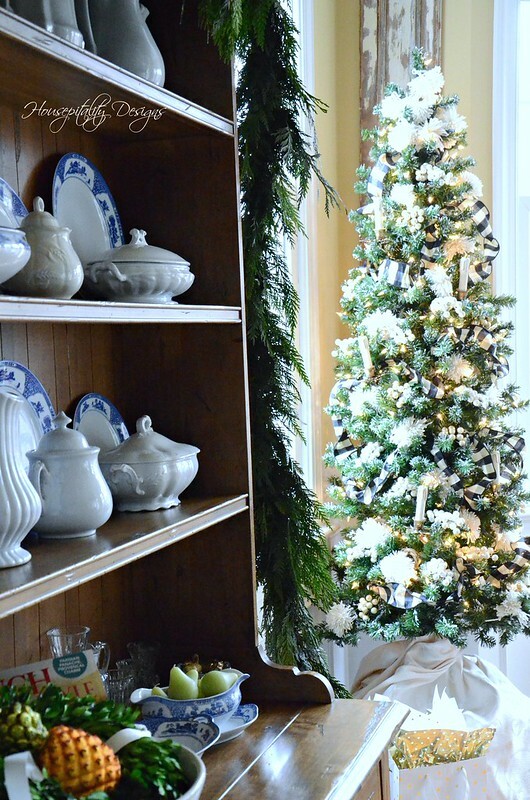 The inspiration for the dining room this year began with a tea kettle. 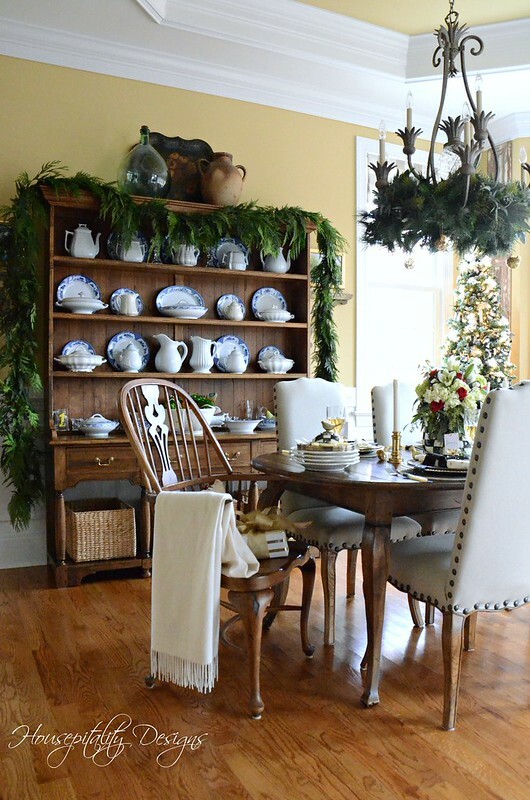 Here is my Holiday Dining Room Featuring MacKenzie-Childs. 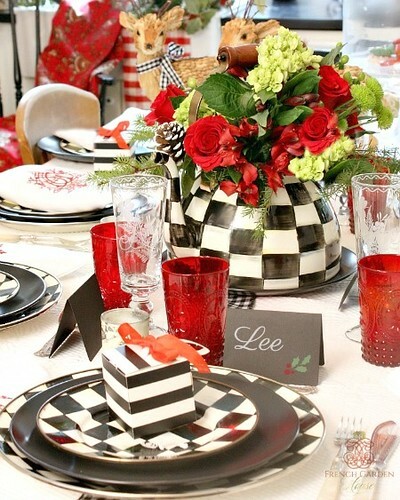 of Amara to bring you a Holiday tablescape using items that you would use everyday. with seasonal decor and flowers. 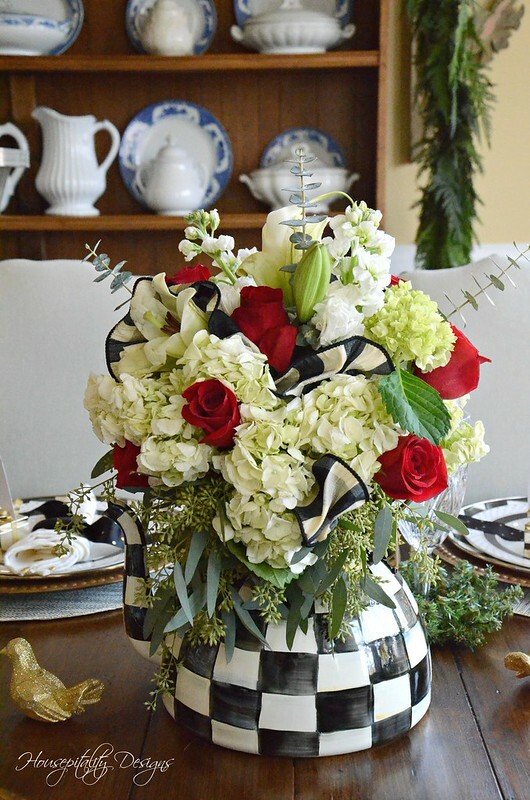 Amara provided us with the items from the MacKenzie-Childs Courtly Check Collection. and have the distinction of award winning service? Yes, they do! The tea kettle is the Courtly Check with the bird lid. You may have heard about the Amara International Blog Awards. won a prestigious award from Amara. The awards ceremony was in England…how great is that?!!! I took the lid off the tea kettle to make the floral arrangement for the table. The beautiful bird on the lid of the tea kettle served as another inspiration piece. The lid sits upon a stack of Courtly Check Salad/Dessert plates. is that you can dress it up or dress it down. Like a little black dress!! I decided that I would love to go in the direction of a transitional tablescape. into a New Year’s Celebration table. 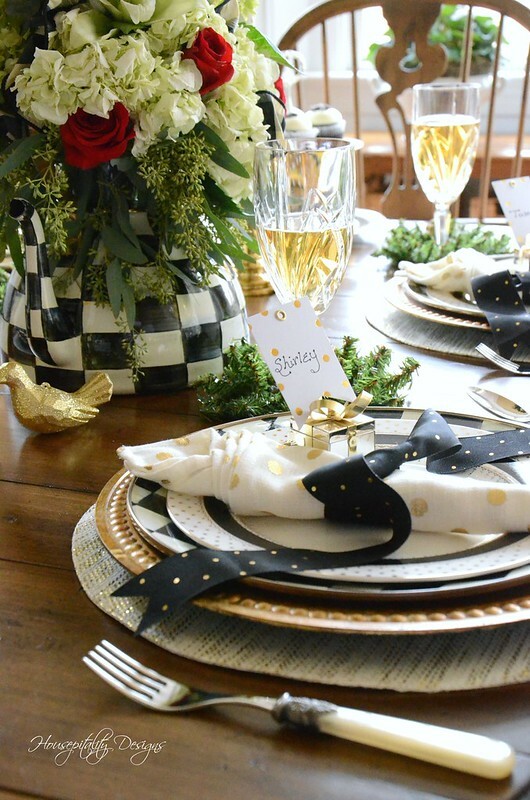 I began creating the place setting with a gold charger. and knew it was the perfect compliment to dress up the Courtly Check Charger/Plate. It’s like putting on the pearls with the little black dress. are made of durable enamel. I love the versatility of these plates. Set them on a beautiful table, or take them on a wonderful picnic! to add another pretty to the table setting. I bring out the silver and gold hinged gift box every year. I found little surprises that my Sweetie placed in those boxes years ago. I had a very special “happy” moment. This year I am using them as place card holders. with long strands to cascade down the plate. in the wreaths that surrounds the champagne filled goblets. 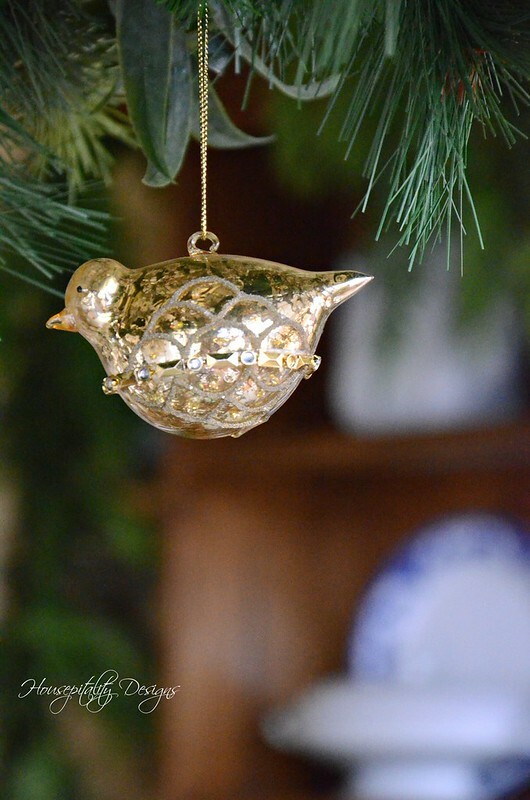 Gold beaded glass birds hang from the greenery placed on the chandelier. I know that a tea kettle is for boiling water for hot beverages such as, well, tea . . .
but look how gorgeous the tea kettle is with flowers in it. Now wouldn’t a tea kettle filled with flowers be so pretty on the stove too?!! The table is set and ready for some Holiday food and fun. 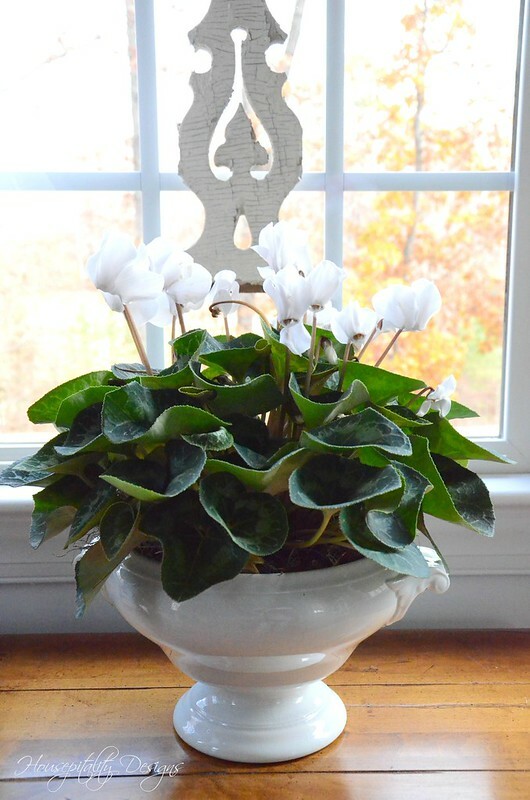 My hubby knows that the Holidays are near when he sees me come home with White Cyclamen. The Cyclamen were placed in vintage Ironstone tureens. O.K . . . I spy a glass that has a bit of champagne missing . . . .
Oh! . . . that is mine . . . I took a couple of sips. How can you photograph a table with champagne in the glasses and not take a sip?!! . . . or two!!! and also the floral arrangement. I decorated the tree rather simply with pearl picks, and tree candles. I made them in the car while traveling to Florida for Thanksgiving. Needless to say that the car was filled with yarn dust! I will show the tree up close and personal later in my parade of trees! Did you spy something hanging from the hutch? It is the Port Orford Garland. 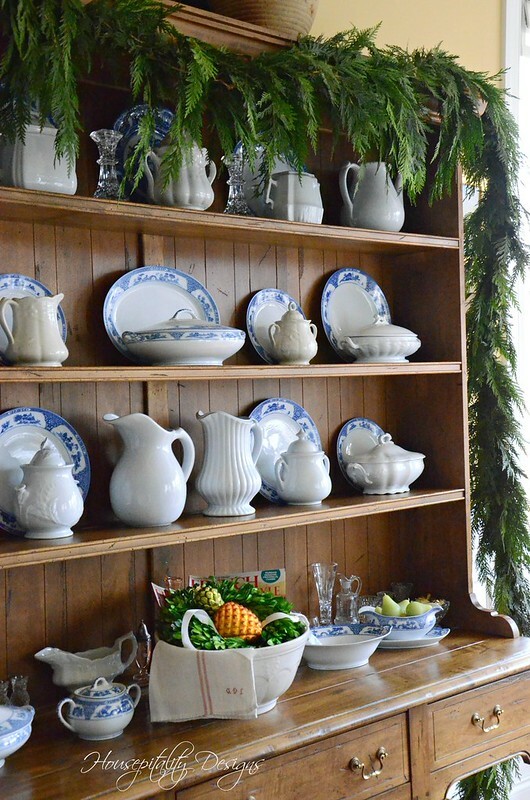 The same garland shown on my Great Room Mantel. which can easily transition to a New Year’s celebration. into something festive and seasonal appropriate. 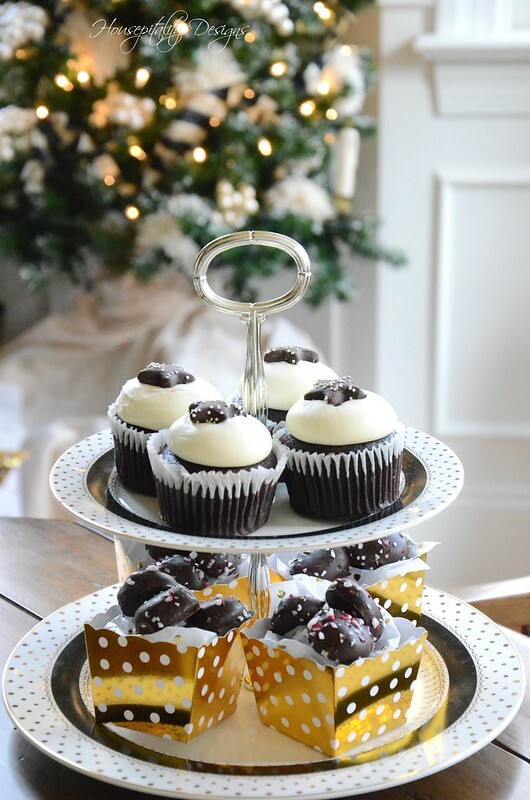 to see Amara’s beautiful Christmas Collection HERE … Their Christmas items are so wonderful! For your convenience, I will list the products I have showcased below with links. Also there is a link of Lidy’s post below. 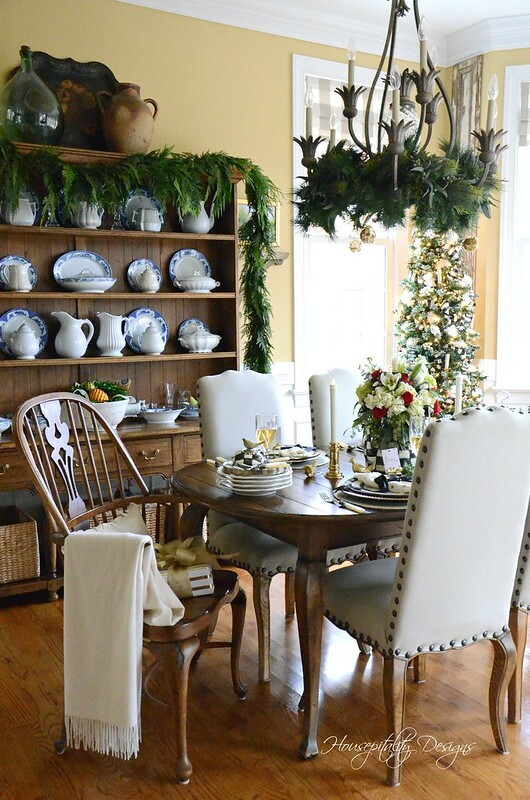 of the Dining Room with my transitional tablescape. HAVE A VERY MERRY DAY!!!! NOTE: Heartfelt thanks to Amara for sending me these products for review. All glorious reviews are truly happily and joyfully my own!!!! HERE ARE THE LINKS TO THE PRODUCTS FOR YOUR ADDED CONVENIENCE. So pretty Shirley! You always do a great job! How beautiful! I have always loved that courtly check pattern. It looks amazing, Shirley. It’s one of my favorite patterns and looks beautiful in your dining room. Thank you so much for the mention! Happy Wednesday! 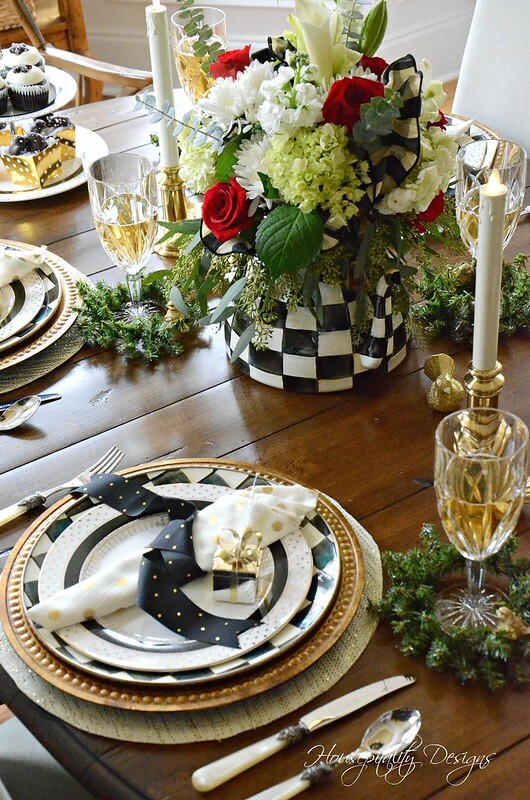 Be still my MacKenzie-Childs loving heart! This is beautiful Shirley!! The tea kettle is absolutely elegant filled with blooms, and I love the pairing of gold with the black & white classic Courtly Check. Your tree is stunning also, gorgeous setting!! Oh my!!! This is beautiful, I especially love the little gold birds!! OH, Shirley, your table is stunningly appointed. How fun to see what you created, it’s just beautiful. 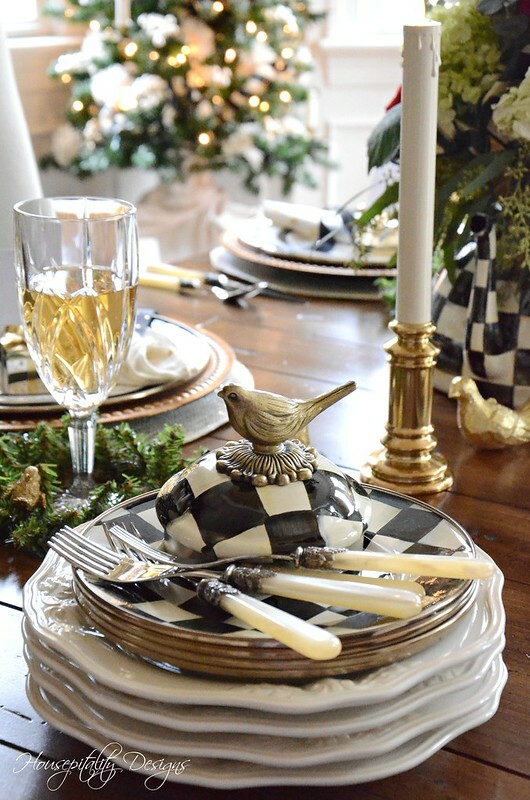 Your elegant take on the Courtly Checks is just another way to show how a classic traditional pattern can be used for elegant settings as well as the more casual French Countey style I used for our table at FrenchGardenHouse. I love it! 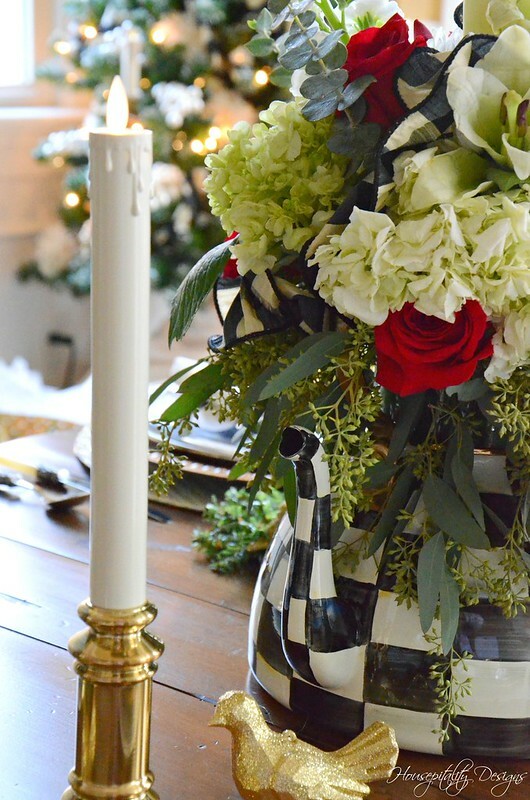 Beautiful tablesetting!…and yes I spy that garland!….it is lovely! Wow! That’s quite an array of products to be able to enjoy from your sponsor! Shirley, you’ve done a terrific job of mixing and pairing the CC pattern with other items you were able to source. Lovely. I am a hug fan of the MKC CC pattern. You’re right – it’s like the LBD. I have been a BIG fan of McKenzie Childs for a very long time, especially the C C pattern. It looks so beautiful on your table. The pattern goes with anything, even vintage dishes. Thanks for sharing! Just beautiful. I started a small collection of the Mackenzie Child’s Courtly pattern earlier this year. I have been using black accents in my home for awhile now and I love how the Courtly looks, especially in my kitchen. We also have a local artist who paints objects in a pattern like Courtly, and I have several of her pieces also. 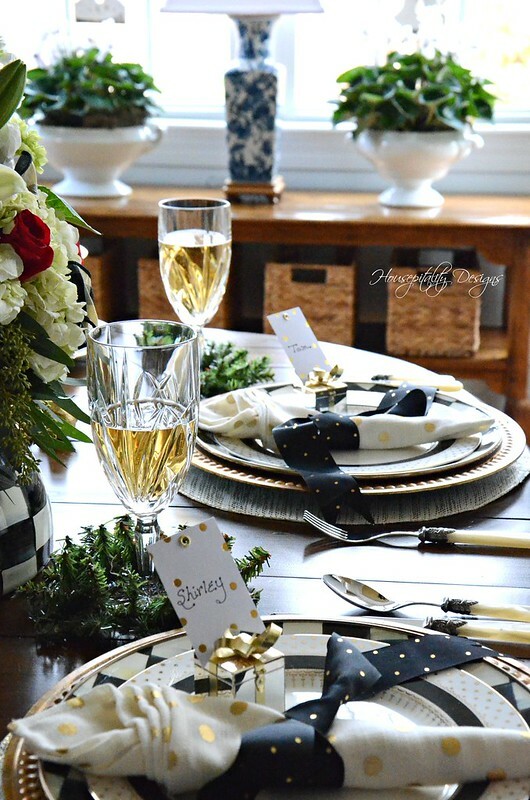 Thank you for sharing your beautiful tablescape with my favorite pattern! Shirley, I have loved MC Courtly Check for years and have so far resisted the urge to buy! But your table is truly beautiful. Every well planned detail is perfect! You have outdone yourself this Christmas season, everything you have shown is pure magic! Swoon Shirley! I’m in love with your table and beautiful centerpiece! 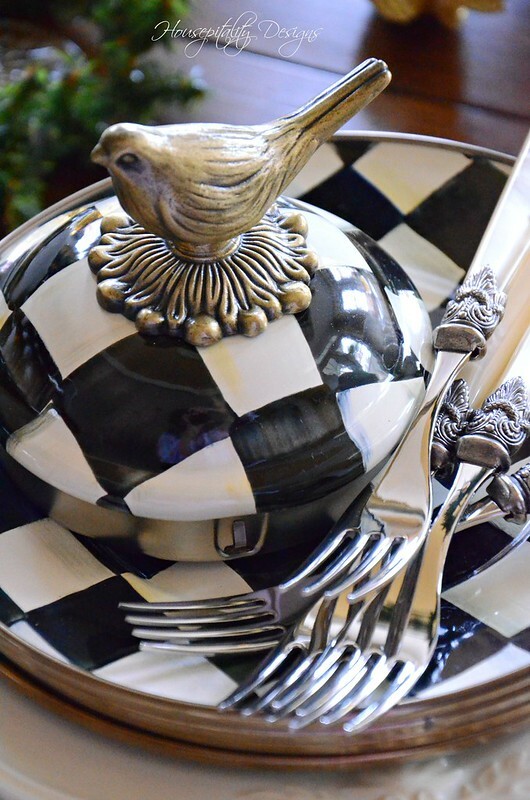 I love MacKenzie-Childs Courtly Check and that tea kettle needs to come home with me to roost in my kitchen! 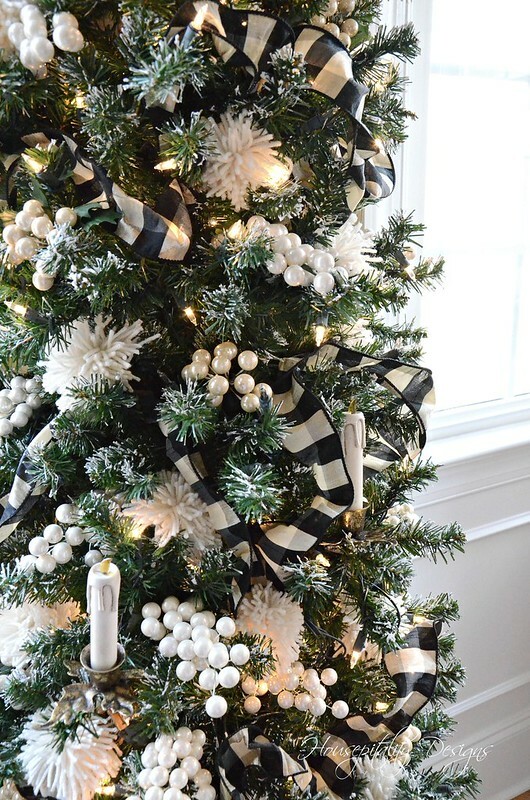 Everything is perfection from the polka dot layers of ribbon and dishes as well as your beautiful tree! Your table is so pretty, as a collector of M-C, I love to see how others use their pieces! 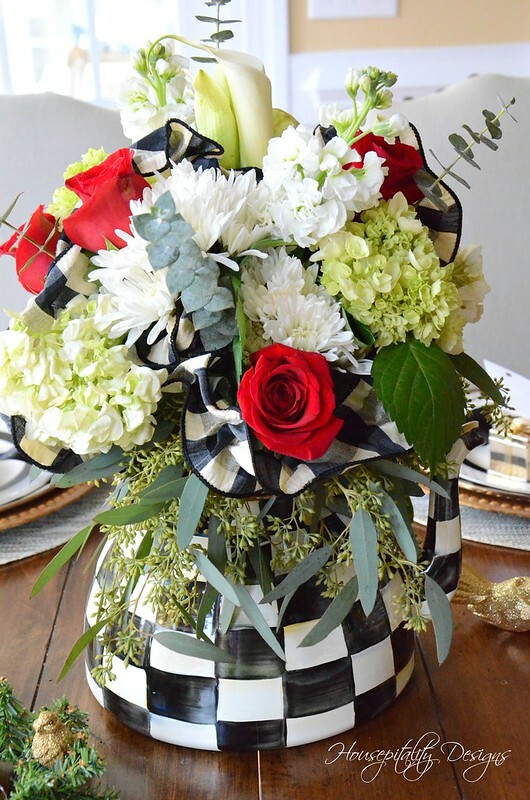 I have also used my kettle as a centerpiece – it is such a versatile piece! Have a merry! That looks stunning! I’m loving the black and white. Great look! This is a very different look for you , but it is terrific. 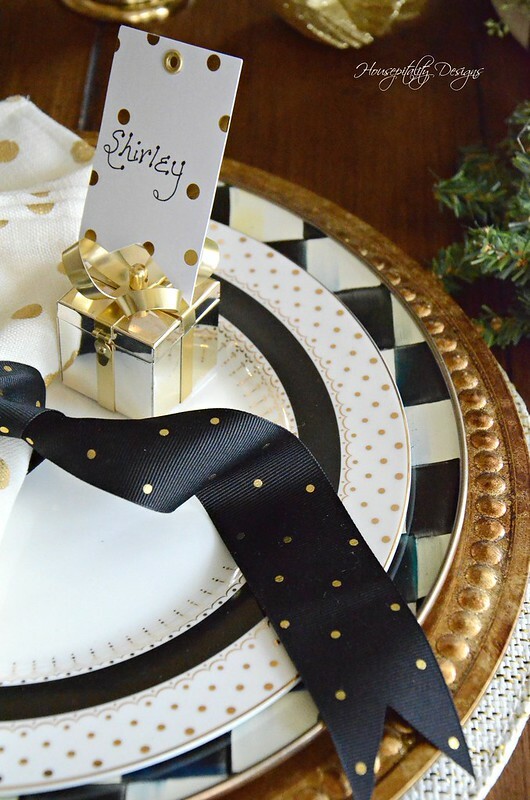 It is elegant with touches of fun that make the table a real winner. I hope friends or family get to enjoy it. You just captured my heart, I’ve been in love with MacKenzie-Child’s for a long time. I have several pieces that I treasure, the tea pot and the three tiered compote and some smaller pieces. Just love what you’ve done with it. Beautiful! I have the large tea kettle in Courtney check and love it. I just ordered couple more items and can’t wait for them to arrive. I have the large courtly check tea kettle with the red knob on my stove ! Love it ! Your dining area looks great ! Merry Christmas ! 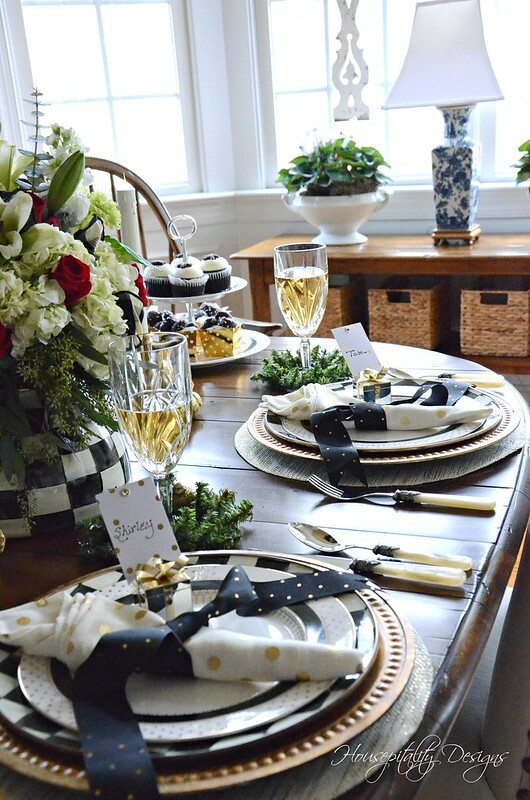 Shirley, I love how you put together all the mix and match elements for this beautiful table setting–prettiest M.C. setting I’ve ever seen! You are so creative. Oh, yes, everything else in the room is also just perfect. On a side note, I’m having a problem viewing your site–can only scroll down a paragraph or two and then won’t let me proceed so I’ve had to go on the web to view your blog. Has anyone else mentioned having this issue? Hugs! I can see why you are so excited. I need you to come do my dining room! It is fun to see some bright red. That arrangement is gorgeous…the wreath draped over your buffet…the place settings…fabulous! !